SYDNEY, Australia, July 15, 2010 (ENS) – The City of Sydney has secured one of 40 Mitsubishi i-MiEVs for its vehicle fleet, the first production electric vehicle to be released in the Australian market. “When I attended the Climate Change Summit in Copenhagen last December, I committed to working with other C40 cities to help expand the uptake of electric vehicles. Today we prove our commitment, joining other green leaders in trialling the i-Miev in Australian conditions,” Lord Mayor Clover Moore MP said Thursday. “Each day more than 700,000 cars travel throughout central Sydney, significantly contributing to smog, greenhouse gas pollution, congestion and noise,” said the mayor. “Electric vehicles, together with public transport, walking and cycling, can help reduce these environmental impacts, as they produce no exhaust emissions. But they must use low or zero carbon emission electricity to reduce greenhouse pollution rather than simply displace it,” she said. Powered by a large lithium-ion battery system and chargable with a 100V or 200V power source in the home, the i-MiEV is a zero-emissions vehicle. Even when taking into account CO2 emissions at the power plants that generate the power needed for charging the car, Mitsubishi says it emits only about 30 percent of the CO2 of a gasoline minicar. The Sydney government has recently established an annual $2 million renewable energy fund to reach its goal to produce 25 to 30 percent of its electricity from renewable sources by 2030. A further 70 percent of power will come from low carbon trigeneration plants that use fuel for three separate functions – the simultaneous production of cooling, heating and power – in one process. The city will operate the i-MiEV in the central business district, CBD, and collect data to measure and compare energy consumption and emission benefits against the petrol, diesel and hybrid powered vehicles. The i-MiEV currently has a range of up to 160 kilometers at top speed of 130 kms per hour, and recharges in less than eight hours using a standard 15 amp power point. The electric car could be widely adopted as close to 85 percent of Australia’s urban commuters travel less than 100 kms per day. Sydney’s electric vehicle trial follows the opening in May of Australia’s first on-street electric vehicle charging station in Glebe for use by car share company GoGet which uses a retrofitted Toyota Prius hybrid vehicle. 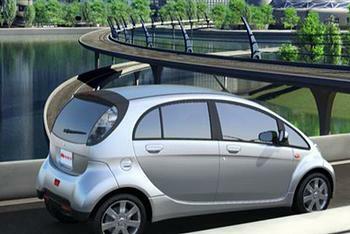 A private urban transport system for the city comprised of electric cars is the vision of Professor Aleksander Samarin at the University of Technology Sydney. “In essence this concept implies that a customer is sold not a car, but a service, consisting of a relatively large fleet of electric vehicles and a dozen or more strategically-placed parking stations, located in and around the CBD, and in large cities, in major suburban shopping centres,” says Samarin. “A ubiquitous smart credit card and a computerised service would ensure that the first available electric car from any of the parking stations in a network, already fully-charged, serviced and cleaned, will be made available on demand to a card-holder,” he has said. In a greener Sydney, electric cars will share the streets with an increasing number of bicycles utilizing a new, comprehensive bike network. Eighty-four percent of inner Sydney residents consider a good bike network to be important, according to a new public opinion poll by Galaxy. Five hundred residents across 14 inner Sydney council areas responded to the poll, which was commissioned by the City as part of a continual consultation and research program on how bike riding is perceived and used by the community. Residents recognize that congestion on Sydney’s roads is a major problem that is forecast to grow 23 percent over the next 15 years. Half of those polled said the main benefit of a cycleway network is less traffic congestion. Bike riding is common in inner Sydney, with as many as one third of residents (33 percent) riding a bike in the past three months. Of those polled, 73 percent aged 18 to 35 years said they would consider taking up riding, or riding more often, if a safe and convenient cycleway network is provided. Across all age groups, the majority of residents (67 percent) agree a safe and convenient bike network will make bike riding a more appealing transport option. 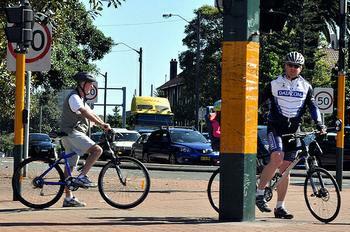 Sydney officials aim to see 10 percent of all trips made by bike by 2016. To support this, the city runs free cycling courses and workshops, and the city is upgrading cycle routes, with plans for 55 kilometers (32 miles) of separated cycleways. The electric vehicle and cycling programs are part of an overall effort by the Sydney government to combat climate change. In 2008, the city became the first carbon neutral local government in Australia through energy efficiency, renewable energy and offsets. In 2009, the city accomplished its second year of carbon neutrality. The goal includes a 20 percent reduction of emissions through energy efficiency by 2012, based on 2006 levels.